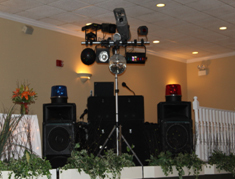 In an effort to ensure top quality sound and appearance, Frank's DJ Service, Inc. uses only professional grade sound and lighting equipment. Here are a few top of the line brand names currently in use: Chauvet, Clay Paky, Denon, Mackie, Peavey, Pioneer, QSC, Sennheiser, Shure, and Yamaha. 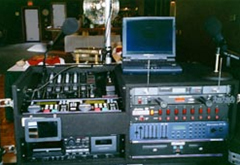 In the event of equipment failure, Frank's DJ Service, Inc. has a backup system readily available at all occasions. Your event will continue as planned, even if the unplanned occurs. 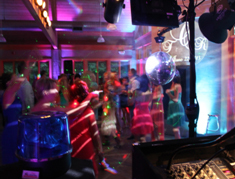 Dance Floor Lighting and Uplighting does not cost extra with Frank's DJ Service, Inc. However, you have the option and choice in deciding what items you would or would not want at your event. Other party favors may also be available through Rhode Island Novelty. 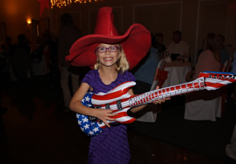 They provide a variety of party supplies and other items. Feel free to ask about certain items of interest for your event. Frank's DJ Service, Inc. ©. All images and content copyright.